To download the 70 pattern cards, an overview, and the complete Wise Democracy Pattern Language use the DOWNLOAD button. 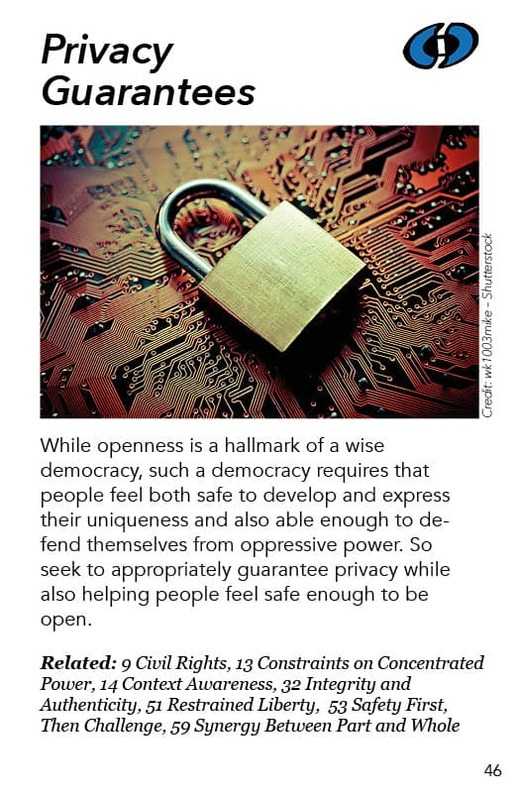 While openness is a hallmark of a wise democracy, such a democracy requires that people feel safe to develop and express their uniqueness and able enough to defend themselves from oppressive power. So seek to appropriately guarantee privacy while also helping people feel safe enough to be open. 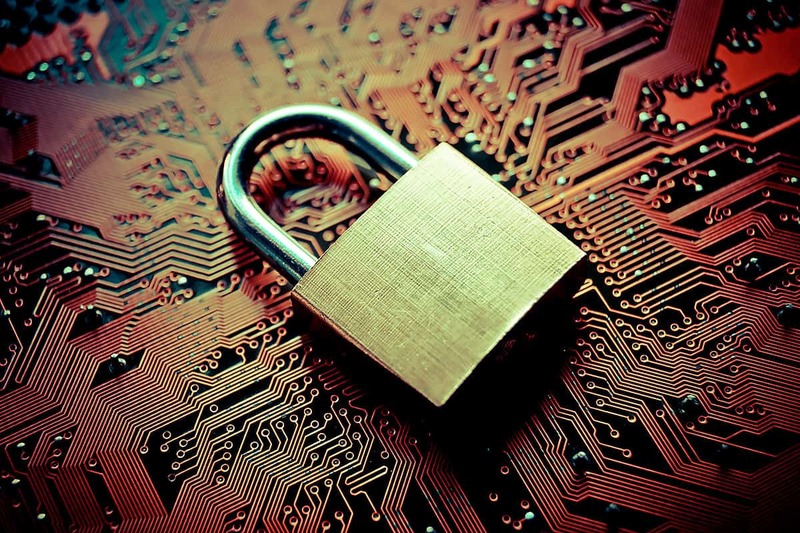 There’s a dynamic tension between openness and privacy. From a collective intelligence perspective, we need people to be open in order for information to flow among them. So there’s a certain bias against holding too much information secret or preventing people from sharing all the material protected by copyright and things like that. We are trying to have things be open, but we don’t want people getting screwed because they’re being open. Being open creates a certain level of vulnerability. People can take what you have, or they can harm you, or they can know where your weak points are. Openness is risky. We need it, but it’s risky. So that’s what this pattern is about, guaranteeing people’s safety to manifest their unique individuality. A main reason we want people to develop and express their uniqueness is to have that uniqueness as a resource for collective intelligence and wisdom. Personal uniqueness is the personal dimension of collective diversity. To the extent everybody is unique, the larger collective that they are part of is diverse. Diversity is a fabulous resource for generating and realizing wisdom and making it happen. We want to have diversity – and other aspects of this pattern language deal with how we go about using that diversity creatively. But we want to have diversity, we want to make it safe for people to be diverse, for people to be themselves with their unique gifts and perspectives, etc. In order to do that they have to defend themselves from oppressive power, from social or governmental power that is trying to create conformity, trying to control what’s going on. So we try to find ways to guarantee their privacy while seeking to make them feel safe to be open. The ACLU and the ACU – the American Conservative Union, the largest grassroots conservative organization in the United States – had an alliance along with other allies against the Patriot Act which had a number of passages which were very invasive of people’s privacy. So there is a funny way that the Left and the Right can come together against violations of people’s privacy, knowing that privacy is so important. They realize that the powers in the government and certain powers in large corporations are against too many guarantees of privacy. A surprising number of different political factions at the grassroots level supported the right for privacy widely across the political spectrum. The Fourth Amendment of the U.S. Constitution guarantees the security of your place, your person and your personal belongings and requires search warrants. The government has to give adequate reason in order to invade that privacy. There’s all sorts of abuses of the process of getting search warrants but institutionally that requirement represents a collective understanding that you have to have a really good reason to violate somebody’s privacy. Edward Snowden’s release of information about the surveillance capacities of the National Security Agency epitomized the whistleblower phenomenon saying, “Here’s a large and powerful government force that specializes in invading privacy. It’s their job to find out what’s going on and what people don’t want the government to know.” There’s a certain logic that supports the government’s need to know, but the NSA had reached way beyond that and Snowden blew the whistle on those aspects of the NSA. He felt their surveillance practices were generalized and not well targeted: they were spying on everyone. Encryption and web anonymity are of course relevant here. We see an arms race between the surveillance forces and the people who are trying to protect themselves. It is a dance, encryption and the ability to break encryption and get around anonymity. All the ways that happens add up to something very much like an arms race. Each new development gets a counter-development, and it just keeps on going forever. But that dance is about this subject, and for the most part success has been on the side of privacy with tremendous battles raging whenever there is a serious violation. The Freedom of Information Act is about the transparency of government. For instance I can write a Freedom of Information Act request to get the FBI’s file on me. In the 1980’s I met somebody who was in an activist household with a group of us in the 1960s, and it turned out there was an FBI informant among us that we never suspected. The fellow I was talking to had found out because he did a Freedom of Information Act (FOIA) request. So the FOIA gives people a certain ability to find out where and how their privacy has been violated. So those are all dimensions of guaranteeing privacy. The more we are thoughtful about “privacy guarantees” and keep the criteria high for violating privacy, the more it fits with what we are trying to do in a wise democracy. We want people to feel safe enough share the kinds of things that need to be shared in order to have the society unfold in wiser directions. And that, paradoxically, requires enabling them to protect themselves from danger and oppression by guaranteeing privacy.